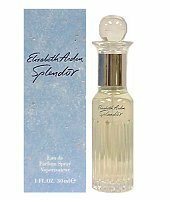 Elizabeth Arden introduced Splendor in 1998. It is the result of the following top fragrance Notes: sweetpea, waterlily and freesia. The middle notes are: magnolia, champagne and musk and the base of the fragrance is: amber, rosewood and sandalwood. Splendor is recommended for romantic use.